More than three million Americans have glaucoma, but only half are actually aware that this “silent thief” is slowly and without warning stealing away their vision, sometimes without symptoms. 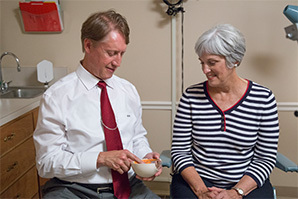 Dr. Curtis Jordan is among the area’s most experienced glaucoma specialists. The two most frequently occurring types are primary open-angle glaucoma and angle-closure glaucoma. With primary open-angle glaucoma, the most common form, the eye’s drainage canals are open, but they have become less efficient in draining fluid. 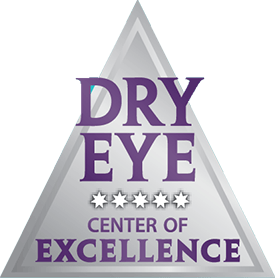 Fluid build-up causes pressure within the eye to increase and eventually damages the optic nerve. In some patients, the optic nerve is at risk because it has become sensitive to even normal pressure. Primary open-angle glaucoma generally does not cause symptoms and leads to gradual vision loss. In angle-closure glaucoma, the iris (the part of the eye that creates eye color) blocks the entrance to the drainage canal, sometimes causing the pressure within the eye to build up suddenly. Symptoms of an acute angle-closure glaucoma attack include severe eye pain, red eye, blurred vision, headache, nausea, and vomiting. This is a true emergency that can lead to blindness if not treated promptly. More commonly, however, the iris blocks the entrance to the drainage canal more slowly and causes chronic angle-closure glaucoma. Cataract formation, too, can sometimes lead to angle-closure. 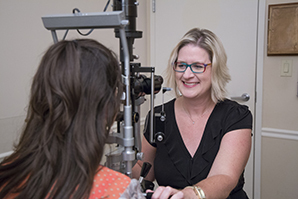 Since early detection is so important to limiting the vision loss associated with glaucoma, regular eye examinations are recommended. Elevated pressure within the eye and other indicators of glaucoma, such as optic nerve damage, can be detected only by a thorough examination. 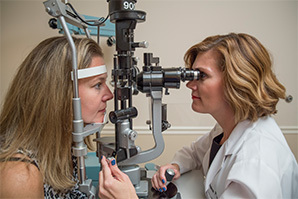 We offer state-of-the-art computerized evaluation techniques to detect early signs of optic nerve damage and peripheral vision loss associated with glaucoma. Everyone is at risk for glaucoma, but some groups are at higher risk than others. 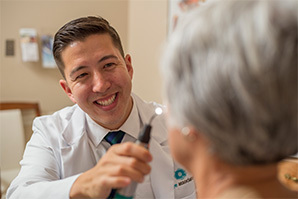 People age 65 or older, family members of those already diagnosed with glaucoma, African-Americans, Asian-Americans, diabetics, and those who are nearsighted or who have suffered severe injury to the eye are all at elevated risk. Again, early detection is the key to slowing or halting the progression of this disease. If you have any of these risk factors, a thorough eye examination to evaluate for glaucoma is recommended. I want to know how glaucoma is treated.